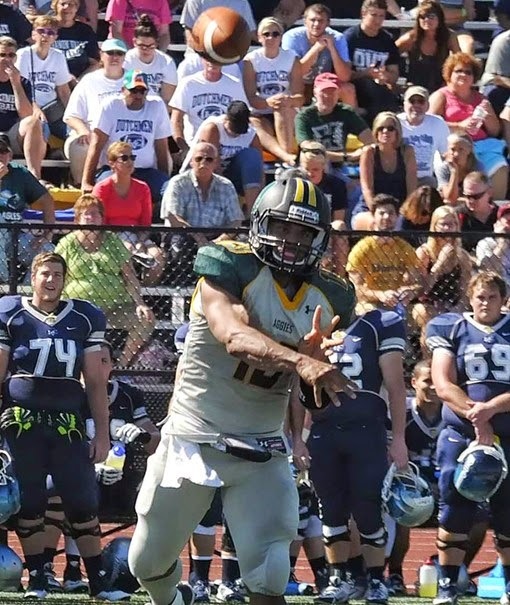 ANNVILLE (PA) – Delaware Valley College senior quarterback Aaron Wilmer (Philadelphia, PA/George Washington) was named the Middle Atlantic Conference (MAC) Offensive Player of the Week for his performance in the Aggies’ 59-41 road victory over defending conference champion Lebanon Valley College on September 27. Wilmer became the third Delaware Valley offensive player in as many games to take home this award. Wide receiver Rasheed Bailey received the honor against Montclair State University in week one and tailback Chris Smallwood earned the award in week three (the Aggies had a bye in week two). Wilmer, a 2014 USA College Football preseason All-American and three-time all-conference honoree, completed 20 of 31 passes for 383 yards and four touchdowns while also rushing for 63 yards and two scores. The passing yardage total was the fourth-highest single game mark in school history and he became the first Aggie to throw for 380 or more yards twice in a career (he threw for 394 yards at Montclair State earlier this season). Wilmer is off to a flying start in 2014 as he is 52-for-89 for 955 yards and eight touchdowns. He has also rushed for 94 yards and three scores. The win over Lebanon Valley kept the Aggies perfect at 3-0 overall and 2-0 in the conference. They will play their next two games at home, starting with Albright College this Saturday, October 4 at 1:00 p.m.